London is full of surprises. One of the biggest surprises is how much fascinating design, art and detail there is above our line of sight that we have never noticed. On a Look Up London walk, you will see London’s Skyline in ‘close up’. Every participant gets their hands on a pair of binoculars and is shown the best vantage points to view the roof tops and building facades of London’s iconic built heritage. You may think you know the West End well, but prepare for some Soho Surprises, from a theatrical hatter to a cricket bat, and a Roman chariot to Art Deco. We end up on a tour of Soho before visiting one of its attractive pubs. How often have you had the opportunity to spy on the upper-storey windows and who knows what you might find in modern day Soho. 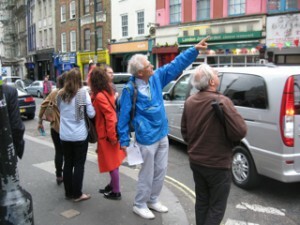 Join this walk, with Soho Simon, for an eye opener or two! 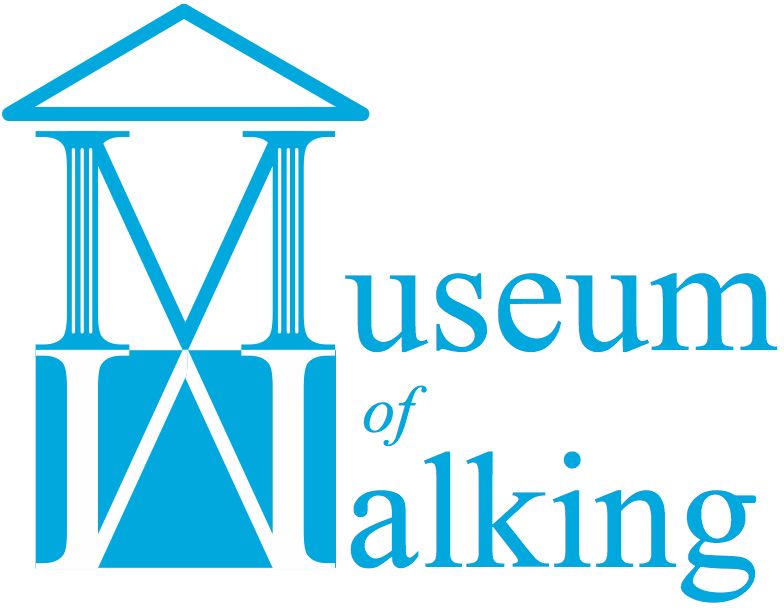 Please contact us at talkingwalking [at] museumofwalking.org.uk if you would like us to deliver a bespoke Look Up walkshop. On a Look Up London walk you will discover some intriguing curiousities that decorate the buildings and we will show you London’s skyline as you won’t have seen it before. These walks are very much for the curious and not for the feint hearted – this will be your chance to be part of one of London’s most idiosyncratic and nosy crowds! For most of us, we have a pretty good idea of the neighbourhoods around where we live and work, but even then our tendency is to look at what’s merely in front or around us at eye level. There’s a lot we miss by not looking up – weather vanes, building decorations, friezes and some intriguing roofs. Yet there’s more still and on this Look Up London Walk we guarantee you will see parts of London as you have never seen them before. Each walk lasts between 90 and 120 minutes and will include an unusual view of London, a flavour of London’s skyline, and some quirky things that are all too British, for most of the walk however, your feet will be firmly on the ground! We will be handing out a field notebook and pencils and other resources, and we encourage you to bring your cameras. We can lend you binoculars but if you have your own, please bring them. Look Up London Walks are not your traditional led walk, as participants are encouraged to do far more than just listen to a guide and walk – they are an opportunity to discuss and share ideas, draw, sketch and photograph, perform individually or as a group, and of course, there’s a pair of binoculars at hand to bring things up close. A refreshing take on a London walk! I loved looking up and being a bit of a snoop! You may think you know the West End well, but prepare for some surprises, from a theatrical hatter to a cricket bat, and a Roman chariot to Art Deco. We end up on a tour of Soho before visiting one of its attractive pubs.How often have you had the opportunity to spy on the upper-storey windows and who knows what you might find in modern day Soho. Join this walk for an eye opener or two! On a High5 Twilight tour, we guarantee you will see London as you have never seen it before, from lots of different angles – this tour will change your perspective on London’s skyline. Nicknamed the ‘Walkie-Talkie’ and described as “Brutally dominant” by English Heritage 20 Fenchurch Street is one of this tour’s High5. Sky-scrapers vs. Sky-snatchers: Love them or hate them, they are here to stay. In the inter-war years, St James’ was the centre of London’s Club land, and many of the buildings in the area are still occupied by iconic clubs. Their building facades provide secret codes about the activities that take place within them. Sometimes we get the chance to look into the windows of places we will never enter. The whole area is steeped in history and a touch of mythology, and still the lair of the super-rich and a profusion of their movable assets. Richard Rogers has left his mark – back in the 80s he designed the Lloyds Building, turning the inside out, but his latest building in the City, nicknamed “The Cheesegrater” has no central core – so what on earth is holding it up? Is there a cocktail to be found at the base of the “Gherkin”? Never mind footprints, what about a ‘Watermark’ as you leave your signature on the City’s skyline? In traditional London neighbourhoods, there’s a lot we miss by not looking up – weather vanes, building decorations, friezes and some intriguing roofs, but in 21st century London it is all lights, glass and glitter. We currently offer Look Up London walks in the City, Soho, St James’ and South Kensington. dɒmæmbjʊleɪt/ v. [L domus of home, ambulare to walk, move about.] 1 Wander or pace about one’s residence during daylight hours and/or at night. Can be indicative of excessive mental activity.